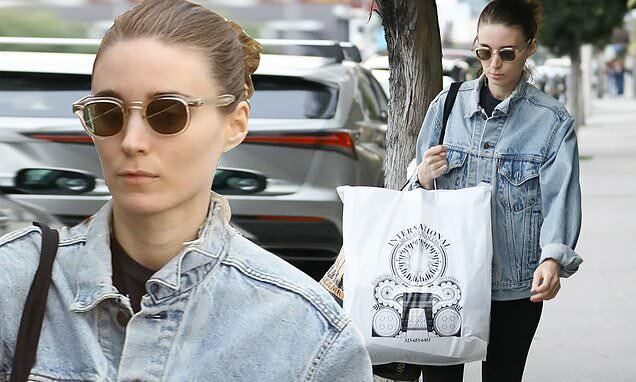 Rooney Mara was spotted this Wednesday walking down a West Hollywood sidewalk after indulging in a bit of retail therapy. The 33-year-old headed into the fashionable neighborhood in a denim jacket and a green-tinted pair of stylish sunglasses. She rounded off her casual ensemble with a pair of black leggings that clashed against her white sneakers and matching socks. There has been a flurry of rumors that Rooney's actress sister Kate Mara is pregnant with her first child by her husband Jamie Bell. Gossip spread of her pregnancy after she spilled the news to Emily Blunt in the ladies' room line at the Golden Globe Awards earlier this month, Page Six alleges. To hear the Page Six insider tell it, Emily remarked that Kate's breasts had grown, prompting the House Of Cards actress to explain why.